As I mentioned at this past weeks community meeting, with Freda gone and Serene absent, it falls to the rest of us to pick up the slack in keeping an active community going. Ada and I are taking over the blender buddies classes. There are a number of other events that Freda used to host that have apparently gone by the wayside, and I am told that the majority of events in opensim used to happen in Kitely. I would like to return to that situation, but we all need to think about what we can do. You don't need to throw a party or hire a singer or dj. Post an event about what you are doing that interests you that you can share with the community. If you can't post events to the kitely calendar, just ask the folks who administer it for the ability to do so. If you have a region open to the public, and have an event to share with the community, odds are you will be given the ability to post events to the community calendar. OK this is a silly question, i think i saw it once now i can't find it. How do we host an event? Not a silly question at all. You don't have to make any special arrangements in Kitely. You simply invite people and make any arrangements needed for the event to happen. To get to your place people need Hypergrid access and a hypergrid address or a landmark. You can find your HG address on the web page where you manage your land. If your event will start at a gathering such as OSCC, you need to give out landmarks at that gathering. You can put the event in the Kitely calendar if you want. Just send me your email address (preferably Gmail) and I will give you posting authority. With an event as part of OSCC, posting in the Kitely calendar may not bring added visitors. Your place has a limit on the number of avatars that are allowed there. If you think you will have more people than that, you can upgrade the place to a higher level (a little higher cost). I doubt that you will have enough visitors to strain the resources Kitely provides, but there are things you can do to manage that. Ask me if you want help on that. And every Thursday evening Seanchai Library hosts Live Storytelling... been going steady for 5 years now. woohoo! All we need is ...YOU! Audience is painfully difficult to attract here in the wild west of opensim.. so ANY help you all can offer or suggest is most welcome. 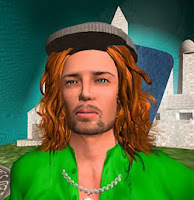 Seanchai hosts 8 to 12 events every week in SL, and have done so successfully since 2006. That's literally THOUSANDS of hours! Wow! The chief obstacle for us for bringing more of these Events to Kitely is attracting audience. I just can't help thinking that of the 107,887 registered Kitely Users, we have to be reaching only a very very tiny tiny number of them with our invitations. Though we LOVE what Ilan has done with putting Events and Market and Destinations and Forum right up front on the login page!! We do have a dedicated small core of folks here that often come by, and we're all nice people and would love to have more of you join us. It is a communal affair.. you get to listen a storyteller and interact with both the storyteller and the audience. We present simultaneously in Second Life and Kitely with intergrid chat and video feed - if you haven't seen this happen you should come check it's out.. it's pretty cool! You can see and chat with your friends in SL without ever leaving the comfort of Kitely! It seems more a challenge of getting the word out. And worldwide grid times. Again though, with more audience we could do more events and with more events we could offer more time slots. I very much agree with Mike, the way to keep a grid alive is to keep it active and dynamic, and events are key to that. And we all want Kitely to stay alive and thrive! "Every single one . . . a fiend from hell." I would like to host an event at the Wounded Knee Memorial site on Saturday, Dec. 29th. Here is background information and an interview about the site that I had built earlier in the year. I will spend the next few weeks trying to put together some speakers. It is an educational event - how would I go about making an announcement? Next, post it in our forums with a detailed Subject containing the date and time. If you do so, I'll make it an announcement in the Kitely forums Events section. Finally, spread the word in as many social media sites as possible, starting from the various OpenSim and Kitely-related Google+ groups. Great tip Selby! Thank you!! We’re still going, and we still need You! We’re wanting to launch a major push into getting the Seanchai schedule and invites to our events out to the rest of Opensim. Our intent is to bring HGers to Kitely, not take our events out there. I guess our first step, which we’ve tried with very limited success before, is to reach out to Grid owners and get permission to post events and invites for their residents. I’m thinking we would offer in turn promo of their grids at our events. The more audience we can bring into Kitely, the better for all of us I believe. Any thoughts or suggestions on this folks?